Who hasn’t felt lost in this crazy journey called life? Whether you’re embarking onto uni, experiencing your quarter life, mid-life or later life crisis we have all felt the pangs of existential purgatory. Bombarded with peer pressure on what to do, how to behave, or where to work can leave us filled with anxiety. 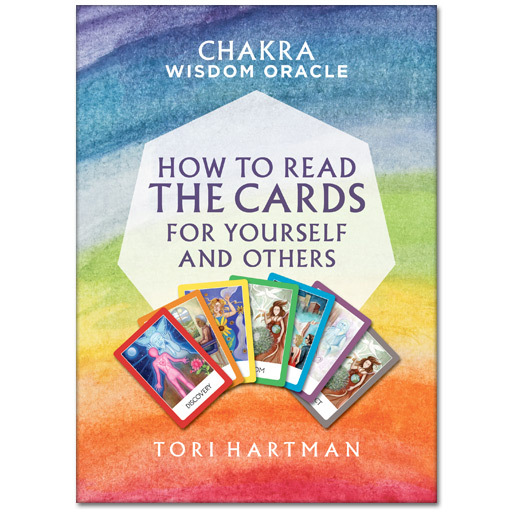 Tori Hartman, intuitive and spiritual advisor and author of Chakra Wisdom Oracle Toolkit, may have the answers to help guide you in your next step. Since Hartman’s near-death experience in 1988, she began to receive messages from angels who regaled her with magnificent fables. Afraid of revealing these spiritual experiences to others she stowed these fables away in a drawer, never to see the light of day for the next two decades. She resurrected these forgotten fables again after helping a friend and Hartman soon realised the life changing affects these stories held. Hartman decided to compile these stories into the Chakra Wisdom Oracle Tool Kit. A combination of self-help advice and colour Chakra insights within charming folk tales ingrained with moral lessons. The book is broken down to a 52 week-span, delegating each day of the week to short exercises and activities that can improve your intuition and life view. What’s great about this book is that Hartman encourages you to learn your own way. She emphasises to listen to your intuition and don’t be hard on yourself if you miss a day of self-study. To further seek answers about your life path, you can use the Chakra Wisdom Oracle cards. 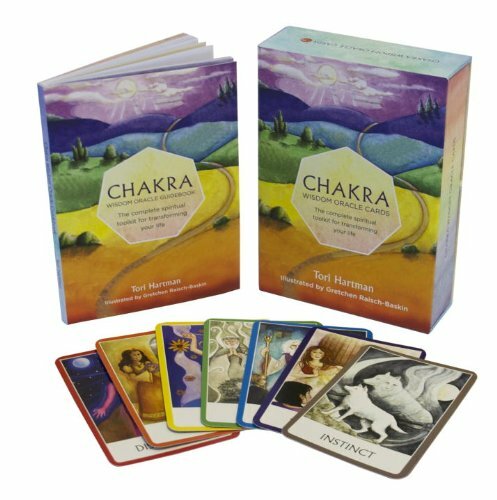 A deck of beautifully hand-drawn illustrations depicting each fable with one of the seven chakra colours trimming each card. A keyword is printed on each card that should be intuitively interpreted to relate to the intended question of your reading. “I’ve made it my life purpose to teach people how to tap into their intuition and master divination tools like oracle card reading and tarot reading. I was a professional clairvoyant and psychic for over twenty years. I grew to the awareness that I wanted to empower others to do readings for themselves”. Below we break down the different type of cards and chakra colours that are included in the deck. Keywords: vital, sexual, passionate, energized, forceful. This is about how you’re building your foundation and what energy you’re putting forth to pursue your dreams and goals. keywords: emotional, motivation, sociable, humanitarian. These cards show our emotional state in a particular situation. keyword: creativity, intellect, precision, cooperation, innovation, originality, wisdom, instinct. Reveals where we are going in life, our approaches to problems solving, and our instincts. Basically, why we do what we do. keywords: balance, harmony, brotherhood, hope, healing, peace, prosperity. These cards correspond with how we feel about where we are in life, and if we are invested in what we’re doing at the time. Following your heart. keywords: truth, loyalty, faith, communication, creativity, expression. Reflects who you really are back to you. How you communicate with their world through your personal expressions and expressing your true feelings. keyword: guidance, secrets, intuition, knowledge, inner child, mystery, dignity. These cards unveil whatever karmic issues you have to work out in life and the inherited traits you may possess from a past life. Reveals what fate may have in store for you. keyword: enlightenment, consciousness, wisdom, spirituality, unity, expansiveness. Reveals your highest calling outside of your physical being. The basis of Tori Hartman’s spiritual work lies in everyone’s natural intuition and connecting with others and yourself. Immerse yourself into the beautiful artwork from the Chakra Wisdom Oracle cards and the pearls of divine wisdom in the Chakra Wisdom Oracle toolkit to help you on your life journey.